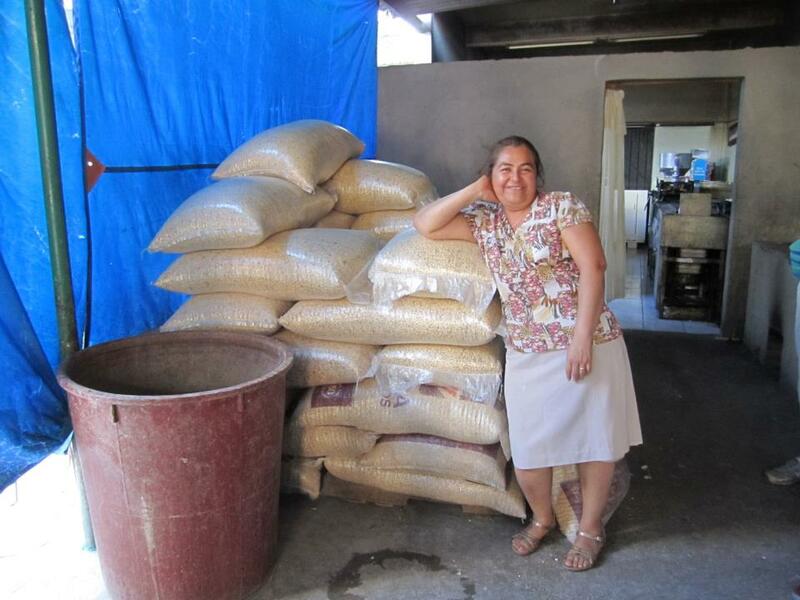 Just back from Oaxaca, Mexico. Witnessed some of the wonderful things being accomplished by micro-finance, courtesy of the good people with Fundación En Vía which is taking an innovative approach of combining interest-free micro-loans, educational programs (mainly in business skills and language), and sustainable tourism (which funds the micro-loans). None are new concepts by themselves, but funding the micro-loans through tours to the producers is a new take. Among my areas of legal practice, I'm an international trade and customs lawyer. In fact, a lot of my legal career has touched on international legal issues - from criminal to immigration to privacy law - but law is at best a facilitating mechanism to help everyone agree on the rules of trade (or other areas of human activity). It doesn't generate the motivation to engage in trade - that can only be done by people who are willing to take risks, look beyond their own backyard, and deal with people whom they might never meet in person, and whom might speak different languages and come from different cultures. Trade can mean different things to different people, but to me it has always meant an exchange of some sort - though not exclusively an economic exchange. I like to think that it's through trade - in goods, services, ideas and cultures - that the world becomes both a better and more interesting place. International and domestic development programs certainly have their place in the world of trade. My work with the World Bank and Asia Pacific Economic Cooperation forum taught me the value of big international development and cooperation projects with big goals, but also demonstrated to me the weaknesses of government-driven programs where capacity building is somewhat top down. However, it's also an error to say that only grass roots, bottom-up or citizen-led programs work, since often funding needs to come from external sources which require a certain degree of accountability and oversight. Fortunately, programs like Fundación En Vía represent a happy medium - local village citizens create the business ideas based on local demand, form three person units to be mutually responsible for repayment (with 7 defaults out of almost 500 loans to date, it's an impressive repayment rate), and Mexican and foreign facilitators administer the program - including fund raising, teaching a few classes, and leading the tours. 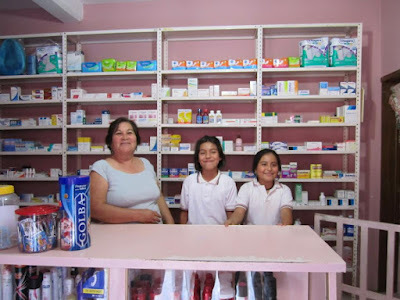 Programs like Fundación En Vía don't directly fit into the model of trade-not-aid, since the photos I have posted here from the three local businesses I was privileged to visit show that two of the three (pharmacy and tortilla production) serve an exclusively domestic market. 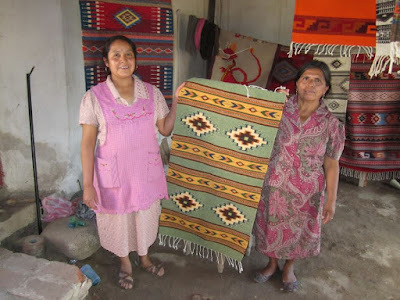 Only the rug weaving seeks an export market (although most of their sales are currently domestic). Still, strong domestic economies fuel export-led growth, and strong exports sustain domestic societies. The origins of the trade-not-aid slogan is a bit murky, but it's been around at least since the 1960's when the United Nations Conference on Trade and Development adopted it. 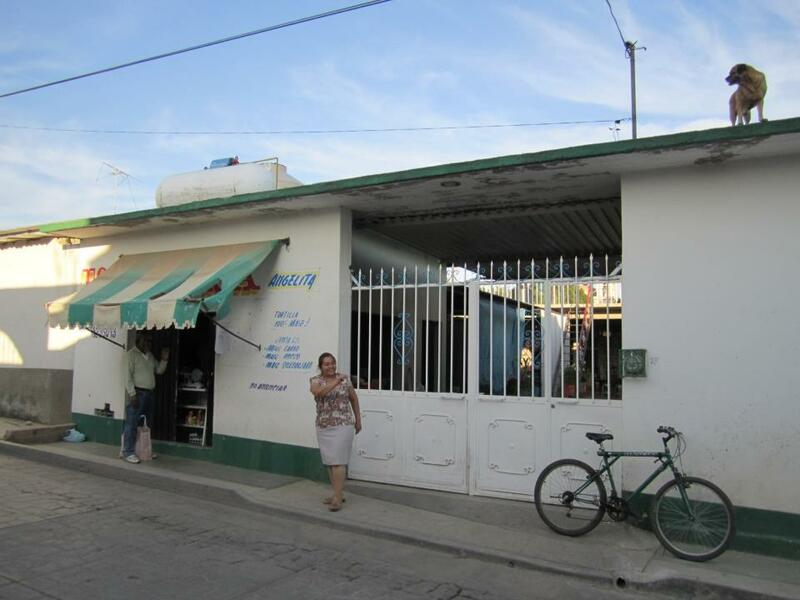 Its most public face is likely the coffee fair trade movement, where producers receive slightly higher prices than is the norm, permitting them (at least in theory) to both expand their operations and raise the standard of living for their families. The trade-not-aid argument goes along the lines that aid fosters dependency, whereas trade promotes self-sufficiency. 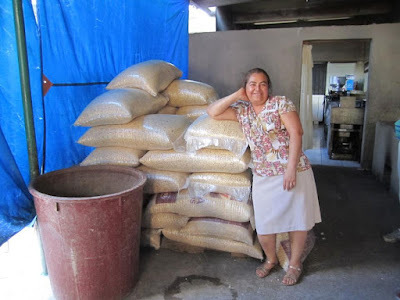 The challenge even within the fair trade movement is that producers may still only receive a fraction of the retail price of a good because of all the intermediaries who need to take a cut of the product's profits on its way to foreign markets. A limited amount of aid might be a precondition to successful trade, particularly where countries are recovering from natural or human disasters. I've witnessed first-hand successful internationally and domestically funded development projects take all sorts of forms after being properly adapted to local conditions. From land and fisheries rights legal registration reform in Fiji seeking to provide certainty over who has a right to what (and thus encourage investment and long term planning), to basic human rights development and land mine removal in Cambodia (so people simply can get back to work), to tsunamani recovery in Sri Lanka (so that people have a place to live while they produce things), to 4G Internet roll out in Lithuania a couple of years ahead of anyone else (showing even a relatively developed but small economy needs a competitive edge). I've also seen the failures, like providing computer labs to rural villages which have no electricity or Internet connections. Unfortunately this wasn't just one village. What was known as the ICT4D movement got a bit carried away when funding actually exceeded need. To make trade-not-aid work, you need a product for which there is international demand, you need a means of marketing it to find buyers for the product, and you need a means of shipping the product at a reasonable cost to your buyers. To take our rug cooperative example from the first photo above, there is definitely an international demand, the Internet would be far and away the best means of marketing (with direct sales commissions as low as a few percent of the selling price through sites like www.etsy.com, compared to 50% or much more through dealer networks), and shipping could certainly be affordable for a fibre product that can be rolled and packaged fairly easily. Best of all, the sales price to a buyer in a place like the U.S. or Canada could be several times higher than the price obtainable in Mexico, and still be a bargain to that buyer, leading to the best of all sales transactions: a very happy seller, and a very happy buyer. The tectonic shift that makes this all possible is the Internet. Now I don't want to sound too much like a high school cheerleader for my favourite (and only) team, but speaking as someone who used to serve as Canada's Director of E-Business Development, the most shocking thing I discovered is that most people aren't all that forward looking at the Internet's potential. Now to be honest, I too don't have much of a clue as to where it's headed, but I'm certain it's going to be huge. Everyone connected to everything connected everywhere. Probably huger than the invention of the printing press! Really. Though I'll give you the invention of agriculture may have been a bigger deal. Practically speaking, what the Internet means for international trade and development is the ability of producers and consumers to connect directly, without intermediaries. Before you shed too many tears over intermediaries being cut out of the picture, there will still be some doing technological mediation, and in any cases there have always been a whole lot more people acting as producers than intermediaries, so expanding producer ability to connect to buyers may in fact expand the overall sellable production pie instead of just slicing it up in different proportions. To take an example from my Oaxaca trip, one of the weaving producers pictured at the top of this post had spent the past two weeks trying to sell her rugs in the local market without any success. That's a lot of time wasted attempting to peddle something where there's clearly too much product and not enough demand for the product. But post that right product in the right place online, with the right description at the right (in fact higher) price and you'll make a sale without any effort - technological mediation will do it for you. Now to accomplish all this you'll need an Internet connection, but from what I've seen throughout the world Internet cafes have spread to the remotest villages and offer their services at prices that are totally affordable to the local populace. Next, you'll need to know where to sell things, and how to post pictures and descriptions of your product. This is a little trickier, but can certainly be taught to most people with basic literacy. To access lucrative northern hemisphere markets, you might also have to be able to describe you product in English. Google Translate and other similar online translation offerings have been making great strides, but are still lacking; likely the best bet is to see if a few word standard description could be developed for common items, without too many details, and hopefully let your pictures do the talking - not ideal, but worth a try, with most of the posting in the local majority language. More challenging is when the producer doesn't know any of the larger languages, such as for indigenous peoples. For instance, we heard of some producers in the Oaxaca area who only spoke one of the many dialects of Zapotec, rather than Spanish. And so where does trade and customs law fit into all of this? For the foreseeable future, there will still be trade barriers among countries. Even free trade agreements, like the North American Free Trade Agreement, hasn't eliminated exceptions to the "free" aspects of the agreements. So for instance, while "art" might be able to be imported duty free, most "crafts" - regardless of how artistic might be their execution - may not qualify as art and instead be classed as home furnishing subject to duty beyond a certain value. And that duty threshold might be a whole lot lower for fibre art because of a desire of certain countries to protect their domestic non-artistic textile businesses, thus essentially trapping art in a t-shirt sweat shop time-warp. The trick with knowing the law is being able to claim tariff classification for your product that is most favourable to its import, and in being able to negotiate with relevant parts of the government like the Canada Border Services Agency or bring an appeal before the Canadian International Trade Tribunal if you think that classification is not reasonable. I'd like to see those weavers selling their beautiful rugs on Etsy, earning top dollar for their work. And I did see one woodcarver from Oaxaca selling his work on Etsy, at North American market prices. smart guy! This is a subject dear to my heart because I think we need more "small" manufacturing in the world - like cottage industries - and less sweat shops and big, wasteful factories (wasteful of lives, mostly). But then the problem of trade comes in and I am never sure how small manufacture can work in a globalized economy. That is, how can small producers sell their stuff to markets far away? I think you are right that the internet could offer some solutions. Let us hope that people are able to take control of their lives and economic futures and that big corporations don't take away the means for small producers to trade their goods. So much better than direct, permanent social welfare. I've always helped people to get out of welfare by encouraging them to update their education. When it involves artistic skills, it's so uplifting.I would hope it' being done on a large scale in Canada. Please correct: "I would hope it is being done...."